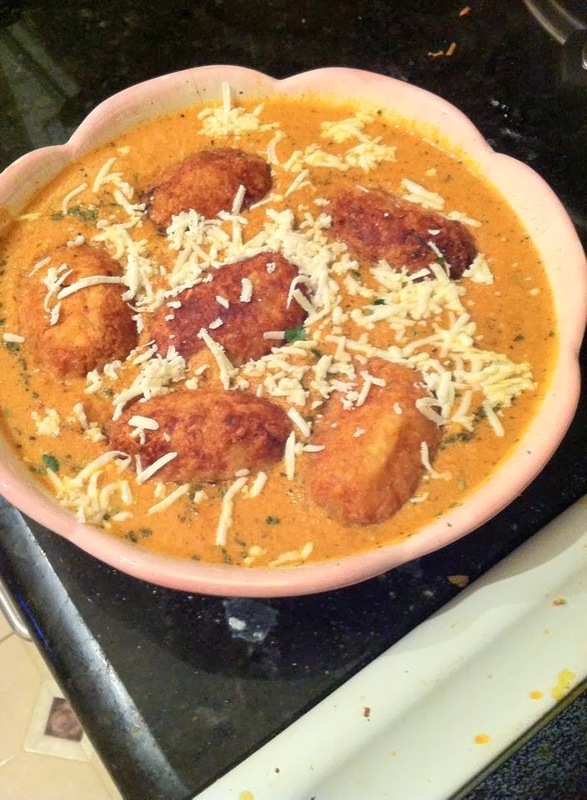 Malai Kofta - Nobody can say no to this creamy side dish. I love this dish so much. Yesterday I made this dish for our dinner. We had it with store bought naan (that was not a good idea though). It was little bit time consuming as I had to make few stuff all by myself like cashew paste, tomato puree etc. But after tasting it, we thought that the time spent cooking this dish is all worth it. I got the inspiration of making this dish from Priya's blog. I almost followed the same except few additions and deletions from hers. Here is my recipe for making this yummy dish. Boil the potatoes and peel the skin and mash it. Mix shredded paneer and the other ingredients given for koftas and make small sized balls. Keep it aside. Mean time, preheat oil in a pan. 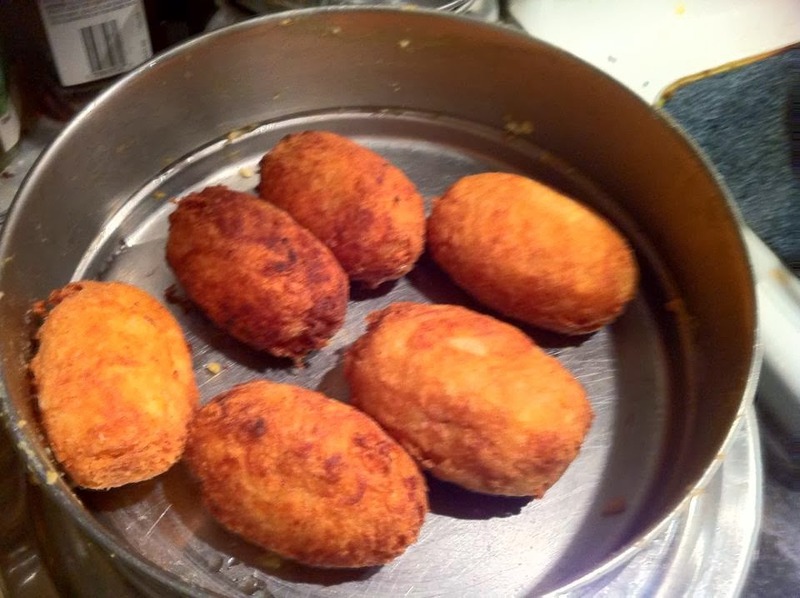 Roll the kofta balls in all purpose flour and fry it in medium flame to golden brown. Keep it aside and let it cool. In a different pan, add few drops of butter, fry cardamom, cloves, cinnamon, star anise and onion adding the ginger garlic paste to it. Fry it until onion becomes pink color. Let it cool for some time. Mean time, grind the chopped tomatoes into puree. When the onion mix is cool, grind it into a fine paste adding little water to it. Now take a pan, heat the remaining butter, add the onion mixture and tomato puree to it. Add required amount of turmeric powder, chilli powder, garam masala powder and salt to it and let it cook in medium flame adding the finely chopped coriander leaves, until the butter starts leaving the sides of the masala. Now add the cashew paste to it and let it mix well with the masala paste. Add milk to the masala and let everything boil for another 5 to 7 minutes until everything mix well together. Adjust the consistency adding little amount of water to it. Turn off the stove. Dry roast the Kasuri methi. Crush it and add it to the gravy. When you are ready to serve, heat it once again if it cold. Add the fried kofta balls in it one by one. Garnish it with shredded paneer and coriander leaves and serve it hot with chapathis, naan or phulkas. * - I did not have tomato puree. So I grind the fresh tomatoes and took the puree. ** - we can increase or decrease the amount of red chilli powder. We dont eat spicy gravy so I added less chilli powder. *** - I did not have cashew paste. So I soaked 2 tsp cashews in couple of tbsp of milk and made this cashew paste. **** - Priya used corn flour for rolling the kofta balls. I did not have corn flour. So she suggested me to roll it in all purpose flour instead. It worked out pretty good.